Do you use Eventbrite to host and publicize events, collect RSVPs, and/or track ticket sales? You can also harness all that collection power, into your Mad Mimi account, too. Eventbrite and Mad Mimi, together forever! Here are the steps you need to follow, in order to connect your two accounts, and get your events and communication humming along smoothly. This process will be smoother, from the beginning, if you’re already logged into your Eventbrite account in another tab (or window) of your browser. If you don’t already have an account, you can grab your free account here, no sweat! Just click on “Add things” at the very top of any Mimi screen, and then scroll to the “Eventbrite” integration. Turn it on, and click on Go set it up. After that, you just have to click the orange “Import…” button in the top right corner, and Mimi will do the rest. She’ll send you an email when your EventBrite contacts are fully imported into your audience. You’ll see them in a special, automatic list. Look at the far bottom of the left-hand grey panel of your lists — the list will be called “Eventbrite”. 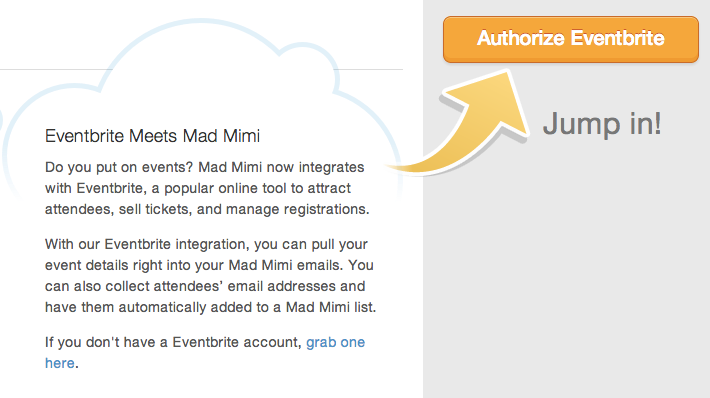 Mimi will import all of your event lists into the same, master Eventbrite list in your Mad Mimi audience. However, you will be able to filter that list by event. Just click on the automatic “Eventbrite” list in your audience, and you’ll see all your events, set up as yellow toggle filters. Click on any of those events, and the toggle filter will turn to blue. 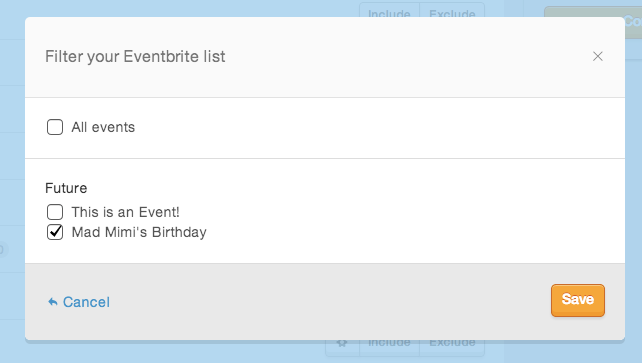 When you click that filter, the view will change from the whole Eventbrite list to just the attendees of that event. You can turn the filters on/off independently, to combine filtering across your events. If the event is showing in blue, then your list display is showing the attendees of that event. If the event is yellow, those attendees are not being shown. 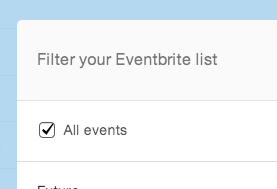 However, if all the events are yellow (turned off), then you’re looking at your entire, master Eventbrite list. If you only have a single event in your Eventbrite account, just click this button to automatically add a link to your event page, right into your promotion. If you have many events, just click this button to select which event you want to add to your email. Click the event you want to add, and Mimi will add a direct link, right into your text, for you, automatically. Whenever you want to send a Mad Mimi promotion to any of your Eventbrite events lists, just hit “Send” on that promotion, from your Mad Mimi dashboard. On that first page you see, you get to choose your audience lists to include in your mailing. If you look at your “Eventbrite” list, you’ll see you have an extra button available, in addition to your Include and Exclude options. Click on that little cog button, to the left of your Include button, and you can select the specific Event list, or combination of event lists, that you’d like to include in this mailing. And that’s about all you need to know in order to optimize your Eventbrite events with your Mad Mimi emails. 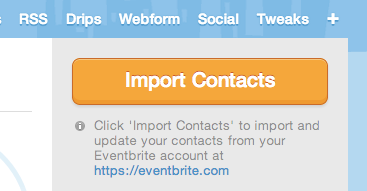 You can find Eventbrite help docs, here. And if you need anything else, just email us! Note: If your event is invitation-only, only attendees who receive an invitation created within Eventbrite will be able to register for your event. The Invitation Only feature does not work in conjunction with invitations sent from outside email services like Mad Mimi. If you would like to use the Invitation Only feature for your event, you will need to create and send your email directly from Eventbrite, using the steps outlined here.